the serous membrane investing the lungs (visceral or pulmonary pleura) and lining the walls of the thoracic cavity (parietal pleura); the two layers enclose a potential space, the pleural cavity. adj., adj pleu´ral. The serous membrane enveloping the lungs and lining the walls of the pulmonary cavities. 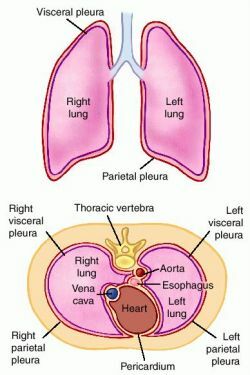 Pleura; for purpose of illustration, the pleural cavity is shown as an actual space. A thin serous membrane in mammals that envelops each lung and folds back to make a lining for the chest cavity. a delicate serous membrane enclosing the lung, composed of a single layer of flattened mesothelial cells resting on a delicate membrane of connective tissue. Beneath the membrane is a stroma of collagenous tissue containing yellow elastic fibers. The pleura divides into the visceral pleura, which covers the lung, dipping into the fissures between the lobes, and the parietal pleura, which lines the chest wall, covers the diaphragm, and reflects over the structures in the mediastinum. The parietal and visceral pleurae are separated from each other by a small amount of fluid that acts as a lubricant as the lungs expand and contract during respiration. See also pleural cavity, pleural space. pleural, adj. The serous membrane enveloping the lungs and lining the walls of the pleural cavity. The portion of the parietal pleura that extends to cover the mediastinum. The serous membrane that lines the chest cavity; it extends from the mediastinal roots of the lungs and covers the sides of the pericardium to the chest wall and backward to the spine. The visceral and parietal pleural layers are separated only by a lubricating secretion. These layers may become adherent or separated by air or by blood, pus, or other fluids, when the lungs or chest wall are injured or inflamed. The portion of the pleura covering the pericardium. The pleura that covers the lungs and enters into and lines the interlobar fissures. 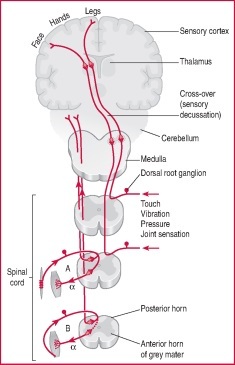 It is loose at the base and at the sternal and vertebral borders to allow for lung expansion. The thin, double-layered membrane that separated the lungs from the inside of the chest wall. The inner layer is attached to the lung and the outer to the inside of the chest cavity. A film of fluid between the two layers provides lubrication to allow smooth movement during breathing. the membrane that covers the lung and lines the innermost wall of the thorax. A delicate membrane that encloses the lungs. 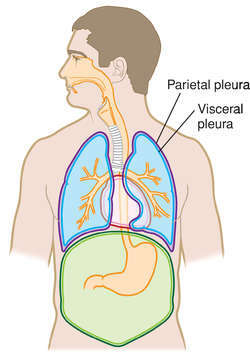 The pleura is divided into two areas separated by fluid-the visceral pleura, which covers the lungs, and the parietal pleura, which lines the chest wall and covers the diaphragm. thin membrane in two layers in continuity, which cover the lung and line its compartment within the thorax on each side; the layers enclose between them the pleural cavity, a 'space' normally occupied only by a thin fluid film; this holds the lungs expanded against their elastic recoil, so that chest wall and lungs move together during the breathing cycle, but allows some sliding movement between them. The lung collapses if the layers become separated by entry of air (pneumothorax). Figure 1.
n one of the two thin, serous membranes that comprise a singular layer of flat mesothelial cells that encloses and lines the lungs. The outer layer, the parietal pleura encases the diaphragm and lines the wall of the chest. The inner layer, the visceral pleura, encases the lungs. Minute amounts of fluid are present between the two layers and serve as a lubricant while the lungs contract and expand during respiration. n a delicate serous membrane enclosing the lung, composed of a single layer of flattened mesothelial cells resting on a delicate membrane of connective tissue. pl. pleurae [Gr.] the serous membrane investing the lungs (pulmonary pleura) and lining the walls of the thoracic cavity (parietal pleura), the two layers enclosing a potential space, the pleural cavity. Needle biopsy of the pleura can establish the diagnosis of a malignant pleural effusion. The endothoracic fascia represents a connective tissue plane that lies between the parietal pleura and the innermost intercostal muscle. Empyemas are purulent pleural collections most readily recognized on imaging by the split pleura sign. Current approach to malignant mesothelioma of the pleura. The application of the educational method of simulation to TUS is feasible, increases student understanding of lung and pleura pathology and improves quality of patient care in the near future. The bi-dimensional (B-mode) ultrasound is used initially with the transducer perpendicular to the ribs so that the screen image depicts two costal ridges, the pleura, and lung tissue in the middle. Full exposure of the right suprarenal tumour with apparent lower part of the right lung within the uninjured pleura. Open adrenalectomy for medium sized adrenocortical tumour: how I do it? Conversely, cysts in the diaphragm, pleura, mediastinum, pericardium, myocardium, fissures, and chest wall are called intrathoracic extrapulmonary cysts6,7 and they can cause a variety of symptoms. Pleura were the most common site of EPTB in our patients following T.
True intrathoracic desmoid tumours are defined as desmoid tumours originating within the pleura or mediastinum, with the majority of the tumour located within the thoracic skeleton and associated with minor chest wall involvement. In this step, with a suspicion to perforation of esophagus, a study by gastrographin is applied which showed discharge of from esophagus to the pleura and mediastinum and this indicated the perforation of esophagus (Figure 3).